Join us for the 4th Annual Tyler Rose City Miracle Run on April 29! 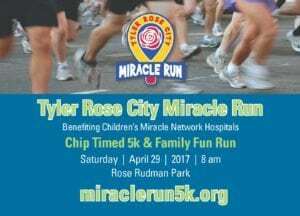 Lace up your shoes and help make miracles for local kids by participating in the 4th Annual Tyler Rose City Miracle Run on Saturday, April 29! This chip timed 5k will take place at Rose Rudman Park with the 5k kicking off at 8:00am and the Family Fun Run to follow. 100% of funds raised through this family friendly event will benefit Children’s Miracle Network Hospitals at CHRISTUS Trinity Mother Frances Health System. To learn more and join the race for Miracles, visit www.miraclerun5k.org!